Book artist Claire Van Vliet, surrounded by the papers and the landscape she loves, is always ready to create. On a morning in Vermont’s Northeast Kingdom, Claire Van Vliet moves around her garden with a visitor, gathering tomatoes for lunch with quiet efficiency. 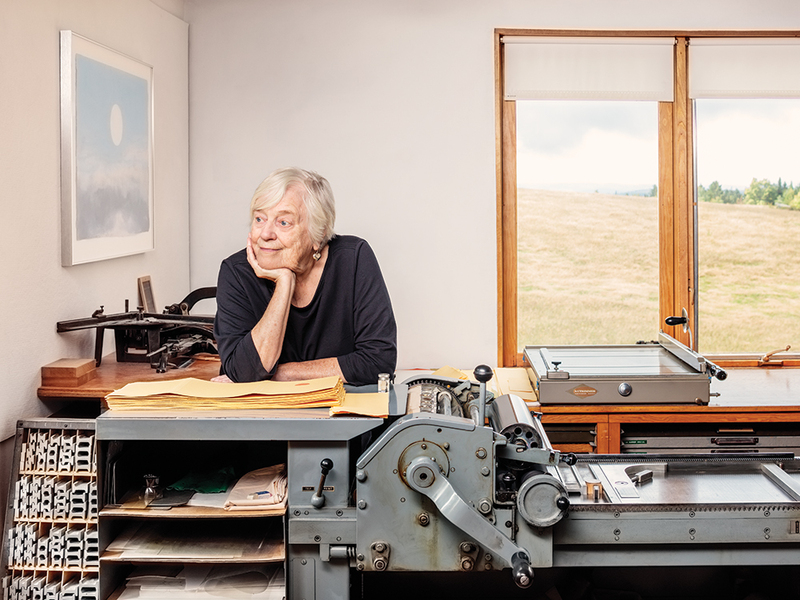 In the 60th year of her celebrated Janus Press, the book artist works from a three-story home that overlooks sweeping fields and the distant Green Mountains. Van Vliet leads us into her cozy ground-floor space that holds the kitchen, eating area, and corner wood stove. After lunch we gather upstairs in her studio before a stack of colorful books. Natural light fills the expansive space defined by clean white walls and wood floors. A Vandercook cylinder press, typecases, and worktables coexist with a desk and floor-to-ceiling bookshelves. 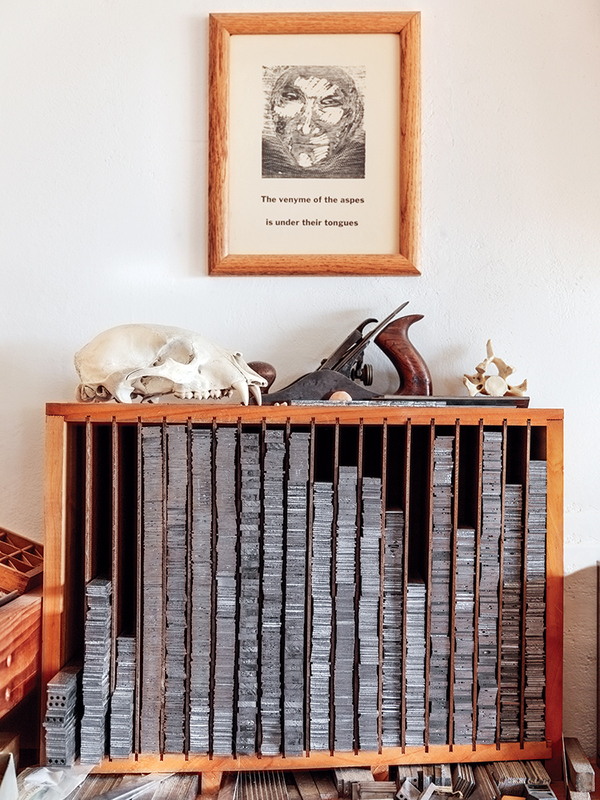 A paper-making studio occupies a side room down some stairs, and a bindery inhabits the third floor. 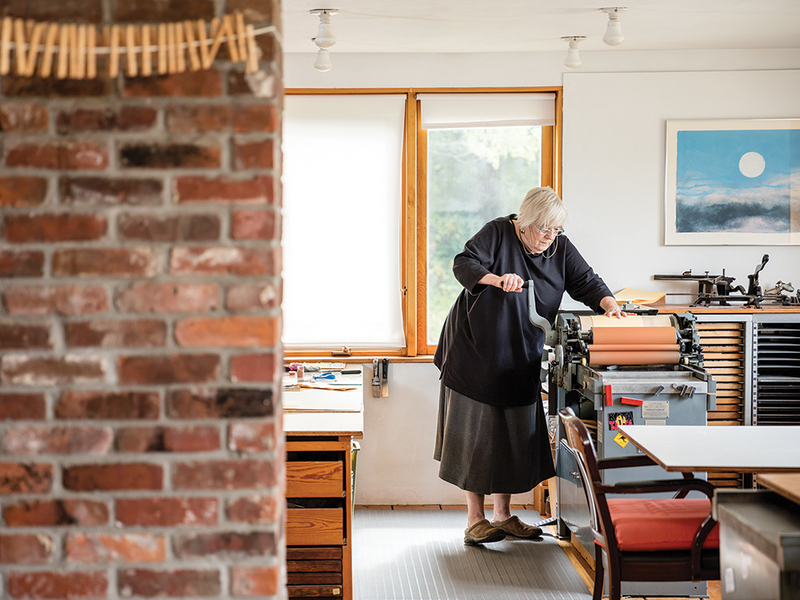 Since she founded Janus Press in 1955, Van Vliet has produced more than 100 books. 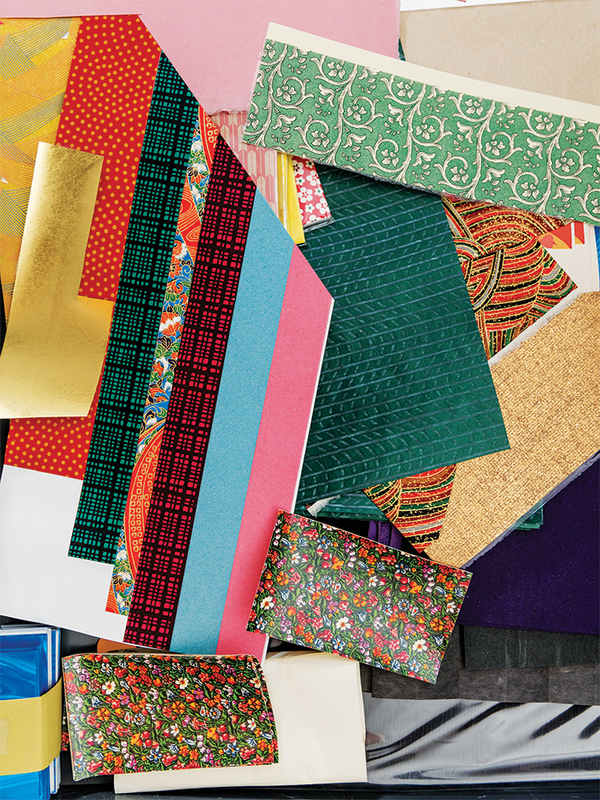 The Library of Congress holds her design archive; but another, living archive fills her house – a treasure trove of decorative and handmade papers that she uses when she creates her striking books. Van Vliet acknowledges that her passion for paper is bounded only by the space available in her home. “I do admit to a vice besides chocolate and murder mysteries,” she says, “and that is buying materials. But I live out of the back of beyond, and it’s much easier to design things when you have all of these wonderful materials around you.” Later, we tour the three levels of her home as she points out where the different papers reside: in closets, under beds, in drawers, and on shelves. Van Vliet is as knowledgeable about world history and local politics as she is about the bookmaking that earned her a Mac-Arthur “genius grant” in 1989. She describes her practice simply: “My inventiveness really is problem solving, because I do not think I am a person who has much fantasy. But I’m a good problem solver.” She is, in fact, a very good problem solver. Her ability to fuse artistry with exceptional craft has produced landmark works and elevated the artistic trajectory of paper. 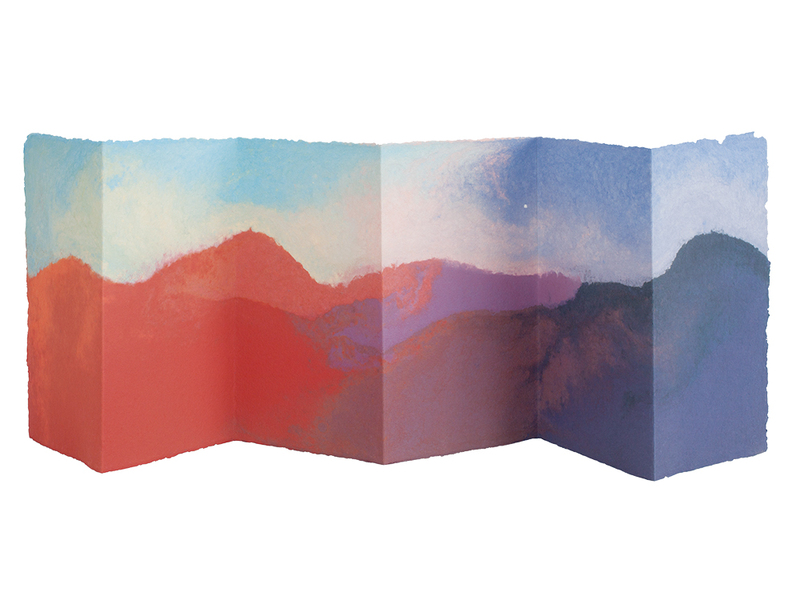 Van Vliet opens Aura (1977), an accordion-fold book depicting the undulating horizon of the Green Mountains, with Hayden Carruth’s poem about twilight printed on the paper wrapper. Its six panels extend 4 feet, depicting a time-lapse transition from daytime’s vivid autumn colors on the left across to evening’s violet shadows on the right. To make it, she layered 12 pigmented paper pulps onto the surface of a paper mold, in a process she developed with Kathryn and Howard Clark of Twinrocker Handmade Paper. Aura generated immediate buzz. Van Vliet’s paper-pulp painting created an image within the paper itself, rather than printed on its surface. The arresting beauty of Aura conveys Van Vliet’s attachment to Vermont, where she has lived since 1966. In 1981 she moved into the home where she now works, amid forests, farmland, and dramatic cloudscapes. Her affinity for the natural world was nurtured from her youth. Born in Ottawa in 1933, the daughter of a Canadian Air Force officer, Van Vliet spent summers with her family enjoying the wild beauty of the Lake of the Woods in northern Ontario. The death of her father, followed by her mother’s death five years later, led to Van Vliet’s relocation at 14 to stay with relatives in Southern California. Propelled by twin traits of intelligence and resourcefulness, she graduated from high school at age 15, completed her undergraduate degree at San Diego State in three years, received her MFA from Claremont Graduate University in 1954, and founded Janus Press the following year. After college, she worked as a typographer in Germany and Philadelphia, and taught printmaking, typography, and drawing in Philadelphia and in Madison, Wisconsin. In addition to her artist’s books, Van Vliet publishes prints, broadsides (prints that incorporate typography), and pulp-painted paperworks. To capture the voice of Aunt Sallie’s Lament (1988), featuring verse by Margaret Kaufman, Van Vliet mined her paper reserves. In the poem, Sallie recalls a life pieced together much like the quilts she makes. 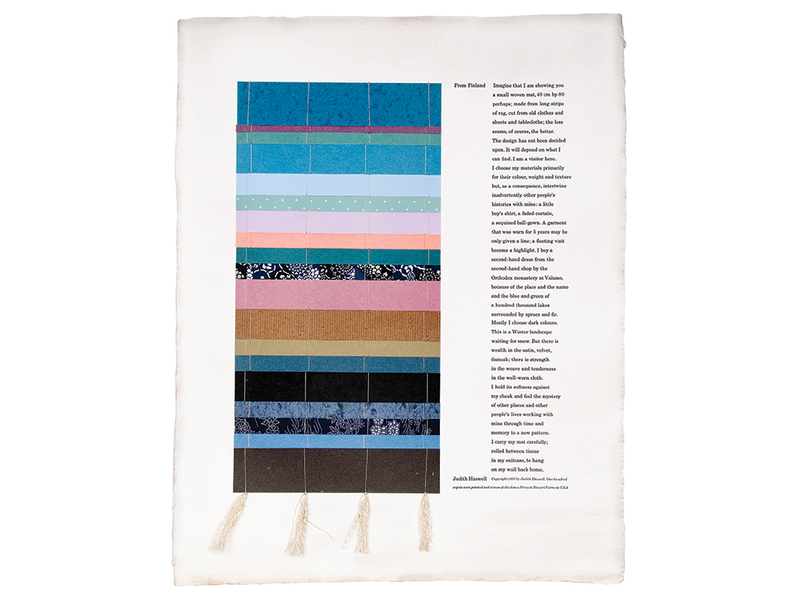 Van Vliet – who has made a few quilts in her day – responded to the poem and the challenge of evoking its contrapuntal voice, which struck her as circular in nature. 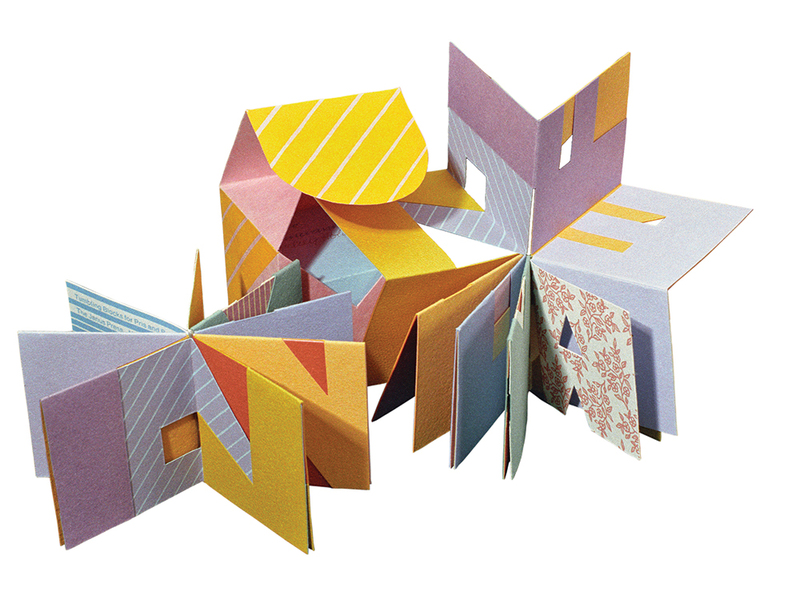 She chose a concertina (multiple-folded) structure, but found her ultimate solution only when she set aside convention: “I turned [the binding] on its side, made it a diamond. 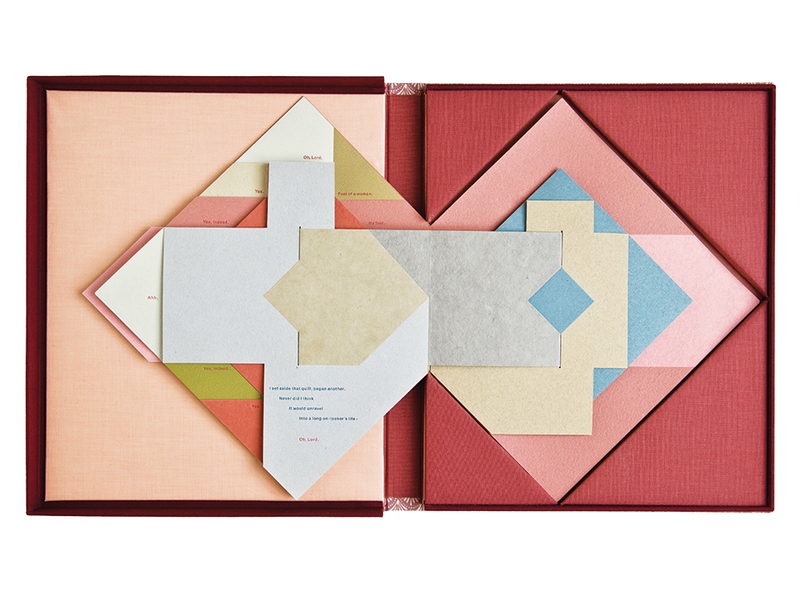 And that solved the problem and allowed us to have the poem go in a full circle, showing how symmetrical the mutterances [the words at the corners] were.” The finished book’s papers differ in color, texture, and pattern, but like quilt pieces, cohere nicely. Sallie’s laments of failed love appear in the center of the irregularly shaped pages, punctuated by her rebukes (“Fool of a woman”) in the outside corners. After Van Vliet pages through the book, she slips out the paper strip that acts as the book’s spine and opens the book laterally. Now the poem can be read in its entirety across the expanse of shaped pages, secure in its concertina binding of abaca paper. Van Vliet’s woven and interlocking non-adhesive structures helped to fuel a widespread interest among bookmakers in lightweight yet durable bindings free from glue’s potential deterioration. In Circulus Sapientiae (Circle of Wisdom) (2001), Van Vliet published 12 songs by the medieval abbess Hildegard von Bingen. Here, paper takes flight in vibrant pop-ups – one suggests angel’s wings – that rise theatrically from pulp-painted backgrounds, orchestrating the reader’s engagement of von Bingen’s sung poetry through eyes, hands, and heart. Van Vliet can’t seem to help herself around a cache of paper. 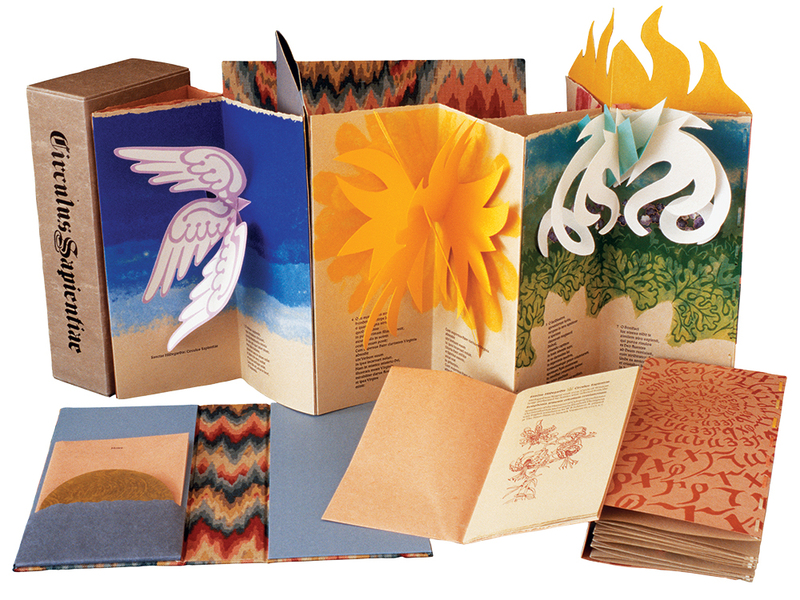 Aunt Sallie’s Lament (Altered) (2004), for example, was prompted by Chronicle Books’ publication in 1993 of a mass-market edition of Van Vliet’s original hand-printed book. Once the Chronicle Books version appeared, she bought 120 copies of it and went to work, producing a profusion of altered copies with dense interplays of color, depth, and form. What has Claire Van Vliet learned in 60 years? Patience. She recounts the axiom that mastery requires 10,000 hours of practice. Without it, “the work will show it, because it’s not authentic – it is an act of will.” Her voice grows quiet. “The book, the work, makes itself known. You can’t will it into existence. It will tell you when it’s right. 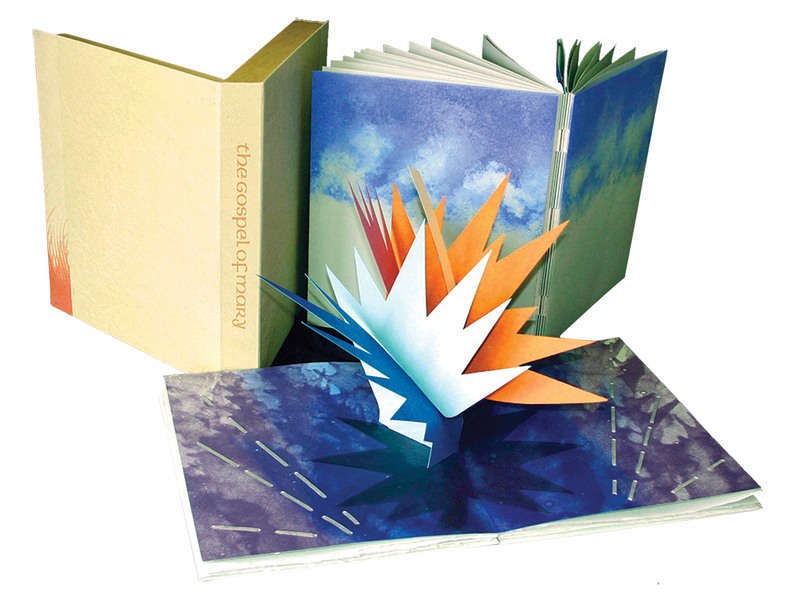 Betty Bright is an independent writer, curator, and historian who specializes in the book arts.